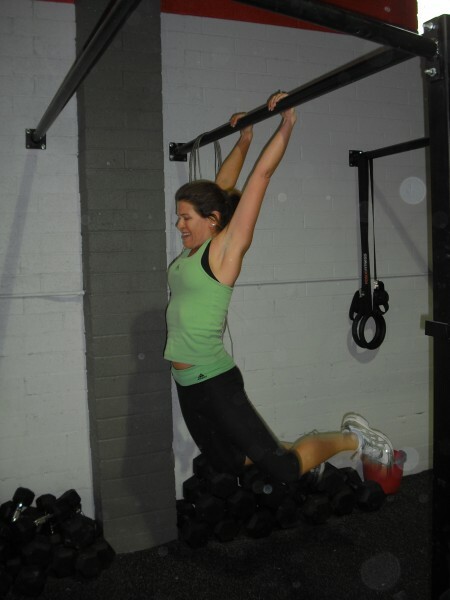 KellBelle is a kipping pull-up machine! I was recently asked by a new client if I could recommend any good ab exercises to help flatten her stomach. This is an unfortunate misunderstanding of human physiology perpetuated by late-night exercise equipment infomercials. Exercising a muscle or a group of muscles more, for example the abdominal wall, does nothing to help reduce the amount of fat that just happens to be stored around it. Performing hundreds of sit-ups will do nothing to make your stomach any flatter. The truth is that you cannot spot reduce body fat, unless of course you pay a surgeon to perform some rather invasive procedures. Numerous studies have been conducted over the years to disprove this myth. One study postulated that elite tennis players should have significantly less fat in their dominant arm versus their non-dominant arm. Researchers found that the dominant arm of the tennis players had significantly more girth due to exercise-induced hypertrophy yet the amount of subcutaneous fat on both arms was identical. Another study utilized a “27-day intense sit-up training program.” Researchers measured fat cell diameter at the abdominal, subscapular, and gluteal region. They found that there was no difference in the rate of change amongst the three sites, indicating there was a lack of specific adaptation to the abdominal region. This is not to say exercises that work the “core” are useless. Core work should be done with the focus on increasing midline stabilization, not obtaining a 6-pack. If fat loss is your goal, focus on your nutrition instead of new sit-up variations. Try cutting out refined carbohydrates like bread, pasta, cereal, rice, grains, and sugar in favor of fresh fruits and vegetables. For further reading, pick-up a copy of “The Paleo Diet for Athletes” by Dr. Loren Cordain or “Mastering the Zone” by Dr. Barry Sears. Physiology of sport and exercise. Jack H. Wilmore, David L. Costill, W. Larry Kenney. 2007.